God does many things we do not understand. When faced with suffering, sickness, death, and confusion, most people can ask only one question: why? Elisabeth Elliot, one of the outstanding women of present-day Christianity, knows too well this feeling of uncertainty. But she also knows that God will answer. ON ASKING GOD WHY offers honest insights into many of today's most prevalent heartaches, including cancer and death, family issues and loneliness, aging and hopelessness. Chapter by chapter, this insightful book will remind you that God invites his children to lay our questions before him because in him we will find every answer we need. - Publisher God does many things we do not understand. When faced with suffering, sickness, death, and confusion, most people can ask only one question: why? Elisabeth Elliot, one of the outstanding women of present-day Christianity, knows too well this feeling of uncertainty. But she also knows that God will answer. Now releasing with a fresh cover, On Asking God Why is a perceptive collection of Elisabeth Elliot's own meditations that confront the many issues we must deal with in our daily lives, from the ordinary occurrence of another birthday to serious topics like funerals, abortion, and divorce. With great insight and candor, Elliot reminds readers that we can overcome our fears when we decide to question God, because in Him we can find every answer we need. 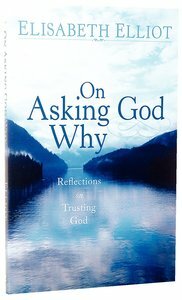 About "On Asking God Why"
God does many things we do not understand. When faced with suffering, sickness, death, and confusion, most people can ask only one question: why? Elisabeth Elliot, one of the outstanding women of present-day Christianity, knows too well this feeling of uncertainty. But she also knows that God will answer. Now releasing with a fresh cover, On Asking God Why is a perceptive collection of Elisabeth Elliot's own meditations that confront the many issues we must deal with in our daily lives, from the ordinary occurrence of another birthday to serious topics like funerals, abortion, and divorce. With great insight and candor, Elliot reminds readers that we can overcome our fears when we decide to question God, because in Him we can find every answer we need.